Albion Cooling Systems providing all your cooler needs! Albion Cooling Systems LTD offers a full range of spares and field service support for any make or type of evaporative cooling equipment. 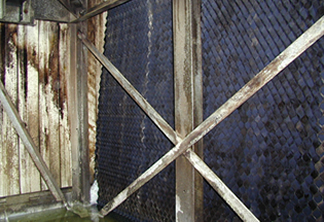 An initial free inspection of any cooling tower can be arranged to advise on the feasibility of repair, refurbishment, or upgrade and, where appropriate, replacement. Faulty, damaged or dirty towers, or components, can seriously affect system performance. Any system running inefficiently will be costing more to run than is necessary. Our skilled workface can undertake repair and maintenance of towers to achieve optimum performance, reliability and efficiency to give clients the best value for their money. Cleaning, disinfection and monitoring of cooling systems are requirements of various legislation and guidelines, including HS(G)70, Approved Code of Practice L8 and TM13, to combat the threat of Legionnaires Disease. Work in compliance with these guidelines available from Albion Cooling Systems, as are service agreements to provide planned maintenance and cleaning systems. 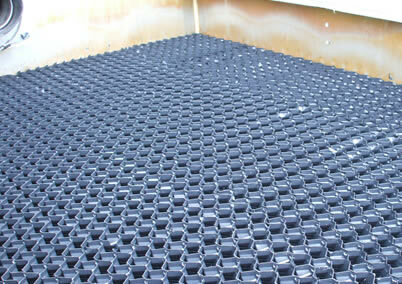 Primary cooling tower components, regardless of original tower manufacture can be supplied. These include counterflow and crossflow fill pack, high efficiency drift eliminators, inlet louvres, water distribution and fan drive systems and, for closed circuit towers and evaporative condensers, replacement heat transfer coils. Fill packs and drift eliminators can be pre-cut to size to suit most types of tower or can also be cut on site if necessary. As well as cleaning and chlorination, on-going water treatment regimes and system monitoring can be provided. Internal and, if required, external painting of towers is available or, where appropriate, re-lining with specialist coatings. These services can also be applied to water storage tanks, such as system buffer tanks, and ‘domestic’ hot or cold water systems. Albion Cooling Systems also provide a complete range of cooling products for new or replacement installations. 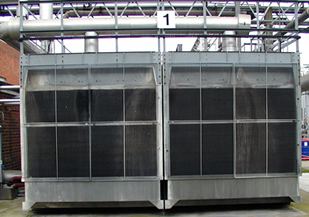 These include counterflow (induced or forced draught) and crossflow open circuit cooling towers, closed circuit coolers and evaporative condensers. Most are available constructed from galvanised or stainless steel and GRP plastic. Dry air and adiabatic coolers and packaged air-cooled chillers can also be supplied, as well as a full range of ancillary products. Albion Cooling Systems are an independent company with fully trained personnel having over thirty years expertise in a wide range of cooling systems and products. All work is carried out in accordance with relevant legislation and guidelines such as L8, and all appropriate documentation is provided. We offer our clients impartial advice based on best practice, health and safety requirements and the specific needs of each business. We support this with the ability and experience to provide the products and services to meet these demands, and a commitment to the standards of service that our clients deserve. As well as cleaning and chlorination, Albion Cooling Systems also provide internal and, if required, external painting of towers. Where appropriate, we provide a re-lining service with specialist coatings. These services can also be applied to water storage tanks, such as system buffer tanks, and ‘domestic’ hot or cold water systems. Albion Cooling Systems also provide a complete range of cooling products for new or replacement installations. These include counterflow (induced or forced draught) and crossflow open circuit cooling towers, closed circuit coolers and evaporative condensers. Most are available constructed from galvanised or stainless steel and GRP plastic. Dry air and adiabatic coolers can also be supplied, as well as a full range of ancillary products.